Etti Palitz is a fine art and commercial photographer based in New York City. Her love affair with the camera began in 1983. She was inspired by how sunlight traveling through a colored glass bowl filled with roses sitting on her coffee table was transformed into an illuminated work of art. Determined to recreate that moment and share this vision with others, she enrolled at the International Center of Photography in New York City and studied under world famous photographers. Etti developed a technique that involves projecting light through several layers of colored glass vases and vessels filled with different colored inks in water. When this method is applied to flowers or other objects like glass or crystal, it creates images with dimension, form, and radiance. Etti has several bodies of work but is best known for her glass and light series. 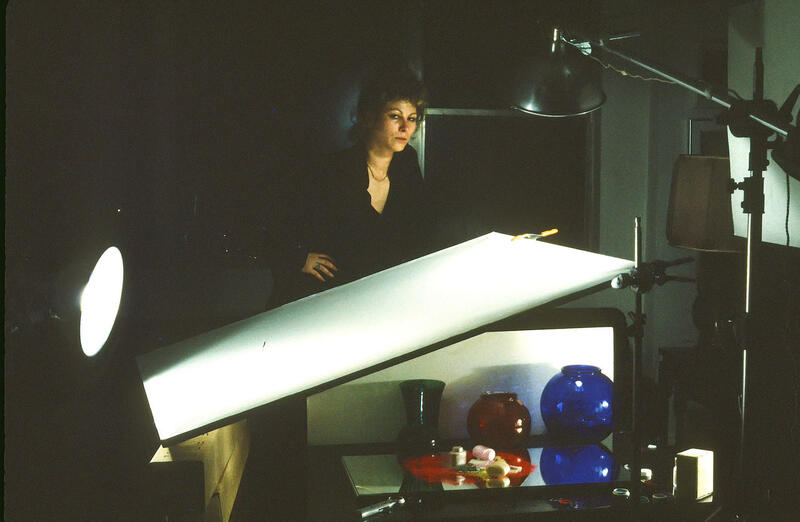 Her photography has attracted many top glass companies including Lalique, Baccarat, Mikasa, Gardner & Barr Venetian Glass, as well as, Bloomingdales and Diane Von Furstenberg to commission her work. She was also represented by Westwood Gallery in SoHo. Today she continues to explore with her technique that creates a pictorial world steeped with light, color, and imagination. "She is an excellent painter who holds a camera instead of a brush. Only a handful of photographers achieve such a complex and unique vision." "Etti Palitz can easily be described as more than a photographer. Whereas other photographers document the reality around them, Palitz colors and changes reality before she documents it through her professional lenses." "She uses photography as a writing and imaging tool to express her life experiences. . . Etti's sense of discovery extends from the childlike view of the world, to that of a fully conscious cosmopolitan woman." "Even though she has established her reputation as a glass photo-artist and these photographs are enhancing the covers of magazines. . . Etti has mobilized her camera in other domains. In her first solo show entitled 'Daniella, A Doll's Story'. . . she employes the allegorical use of dolls: shattering the old myth of Prince Charming and gives a new definition to relationships between men and women in the reality of the new millennium. Yes, this kind of social statement defines Etti's artistic journey and as always through the lens."